I hope this post finds you well. I got up early this Saturday morning (5:30am) to go on an early morning run. I succeeded in doing so. I did a little editing of a podcast I am posting tomorrow, drank some Gatorade G2, had a little apple sauce. By the time I got to the track (6:39 am), it was already bustling with walkers. Anybody already out walking around a track at 6:45am on a Saturday morning, has got to be serious about their fitness. I warmed up and started my run. After the first lap I already heard that G2 in my stomach and yet again realized one thing: I dislike running outdoors, which made me realize another thing: I have to start running more outdoors. While running outdoors is far more popular, running in the gym is more convenient for me (and my performance is much better). I want the best of both worlds, so time to have at it. Today’s run was eh…not my best time. I’m still not convinced my form is quite right (meaning foot placement), maybe still too much heel. I’m learning to land a bit more on the balls of my feet but not totally, as I watch other runners for their form and it seems they are not on their heels at all. I’ll get there. Right now the goal is to build cardiovascular endurance. 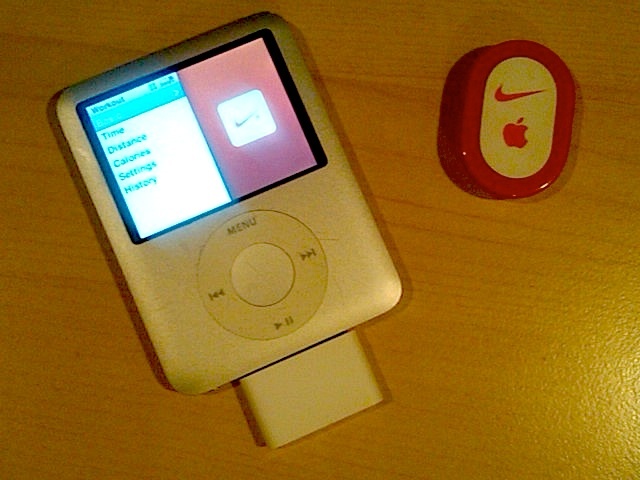 On a related note, I got the pleasure of teaching a good friend all I know about Nike+ (she seems to think I should work for them or something, based on my blog posts- *wink*) I think she’s gonna enjoy using it, via the Sportsband or iPod solution! Best wishes whenever she gets started. Time to keep it movin’ this day…. Had a really good run during lunch. Everything about it from the mental prep through the end of it was good. The gym was packed with an exercise class right in front of me – maybe that added a lil energy to me as well. The anomaly was me somehow during off the female feedback voice (or so I thought I did – checking the iPod now shows it as on) I didn’t hear her during the whole run, which resulted in a longer, but best workout length so far. After work, my kids persuaded me to head out to the track so they could jog, so I guess I can add that on as post-run activity. I also met my first goal! Answering my friend’s tweet, I’ll sleep good tonite! On another note…this was a family event. Wife and kids came this time. Son had a good share of running, while the ladies near power-walked. Great temps – low 70’s. More people were on the tennis courts than on the track, although by 8:15pm, people were still coming. I’ll miss daylight savings time. Anyway, the dreaded run stats: Ran 0.92 mi on 8/6/2010 at 5:44 PM. Looking to do a 6am run in the morning., Seeing as it’s 10:47pm, I should be getting in the bed, huh? I trust all is well with you. I got in not too long ago from the track, where my kids decided they wanted to go for a run. It was my daughter’s first time and she did well. We jogged two laps and walked two. As expected (at 8:10pm) there were a good amount of runners and walkers at the track, per the cooler temps. After a few days off, I finally got back to my regular lunch time run schedule. Today was another personal best (as notified by Tiger Woods in my headphones after I completed the workout). It’s really convenient to have a gym in the building, as lunchtime is the perfect time to run for me during the week. Run stats are below, along with a description of my run. My daughter has a new iPod Touch, which comes with the Nike+ app preloaded. 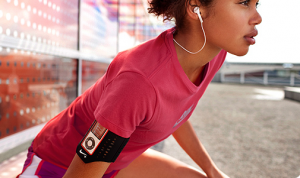 If she gets into running, all I need to do is get her the sensor and maybe even the shoes…or neither…go for the wristband. 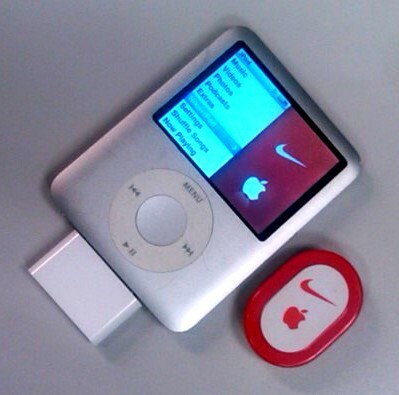 Looking for a cheap iPod Nano for my son, as he is sensor all the way. 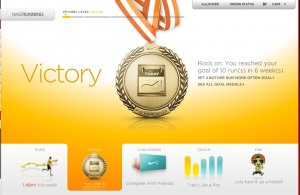 He gets a kick out of the Nike+ minis (think Wii Miis) on the website…go figure. Hope all is well. After a string of HOT days, the temps have eased down a bit. I packed my gym bag this morning hoping to run, but didn’t think I’d get it in. Boss is back from vacation and had ANOTHER meeting that dipped into my lunch hour, but I went and did it anyway. Turns out, it was my best mile yet, so I’m definitely excited about getting THAT news. The pace was good, finally getting the breathing rhythm going a lot smoother. and the form is slowly getting better (less and less shin splints). 10 kilometers down. Now let’s see what else you’ve got. You’re off to a fantastic start. Whether your first 10K was a breeze or hard-earned, keep it up. Never knew I’d love running so much. Hopefully I can hit the track this weekend sometime. Just got in not too long ago from run #4. It’s been a crazy busy weekend and I would have much preferred to run early this morning, but that wasn’t possible at all. That being said, I had to wait until late this evening because of this crazy heat. Lately, my eight year old son has taken up an interest in running since I started, and especially having an understanding how Nike Plus works. He’s always asking for “sensor shoes” and I always gotta tell him they’re not made in his size….yet. Anyway, he begged to go along this time, so we both headed over to PGCC’s track. I knew that it didn’t make sense to log this workout data, figuring I wouldn’t get a consistent run in. We got there and I took him through a stretching routine then we started the jog. I was pleasantly surprised for two things: 1) We did a whole lap non-stop and 2) Running at his pace told me MAYBE I should slow my pace to his on my regular runs! We completed lap #1 and walked a cool down lap for the second one. Lap #3 was a job again…all the way through…I’mproud ;-). Lap #4, the final lap was a cooldown walk, followed by stretching. Big surprise was a 5th lap…wow, at his request. It was fun, and in hindsight, I might have done my best time in the mile yet…something I didn’t expect this evening. 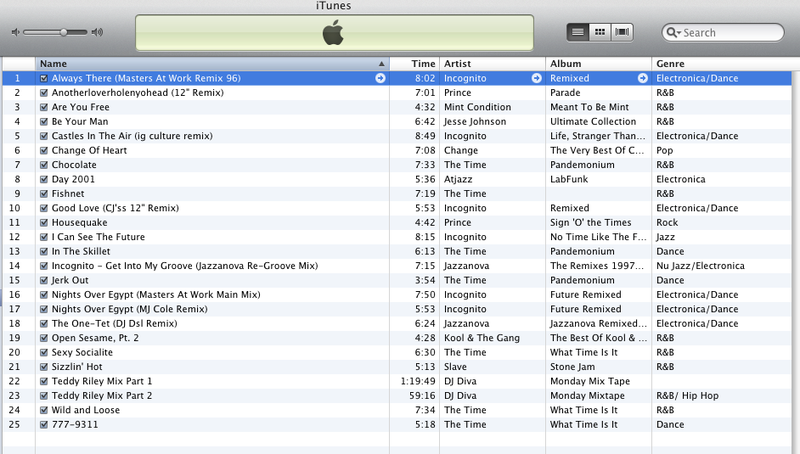 Too bad I didn’t log this data on the iPod! Oh well. The plan is to hit the track at 6am tomorrow, but the morning rush to work. Which means off to bed within the hour. Have a good night.